Following his defeat in the Presidential election, Governor Mitt Romney, in a conference call with donors, offered the opinion that the Democrats won by offering gifts to voters, by offering specific programs tailored at certain demographics. Louisiana Governor Bobby Jindal, in response, offered a sharp critique of those comments. Count this blog as agreeing with both sets of comments. Governor Romney is at least partially correct in his characterization of Obama's strategy -- his plans, his vision, as Romney said, were from the "old playbook" of Democratic politics -- putting together a string of various interest groups and have it add up to an election victory. On immigration, his views were able to win him the states of Colorado, Nevada, and New Mexico -- and a narrow win in Florida. On the auto bailout, his vision for state-supported industries was able to win him the key midwestern battlegrounds of Ohio and Michigan. On abortion, he was able to earn the votes of the majority of single women. On a broad basis, his vision of a dependent state on issues such as student loans and health care earned him votes among young people and the poor. The fact is that many Americans presently do feel the government has a responsibility to provide them things....because they don't believe there is any other realistic way to do so. Where Governor Romney faulted, however, was offering an alternative vision that people, as a whole, could grasp onto so the notion of a big government wasn't the only vision out there. What plans he offered were too confusing to explain to the average voter quickly, nor was he effective at articulating the conservative philosophy on a broader basis as well. Finally, his background at Bain (unfairly, perhaps) and his ill-advised comments on the "47%" led many Americans to feel he simply didn't like them or didn't care about them -- or led even those among the 53% to believe that Romney didn't care about their friends who perhaps they identified as part of the 47%. Thus, as Bobby Jindal indicated, the Romney campaign's strategy seemed geared towards winning the remaining 53%. Indeed, Romney's path to electoral victory was always dependent on winning a series of narrow victories in Florida, Ohio, Virginia, Colorado, Wisconsin, Iowa and New Hampshire -- he went 0 for 7 -- but never on really uniting the American people behind his candidacy. In a way, while Romney was not offering the kinds of gifts he criticized Obama for, his campaign was also narrowly tailored -- at getting enough support based upon fear and disapproval of Obama that he could win. While we feel Romney ended up being a pretty good candidate -- well enough to win many elections -- the fact is his message -- his package of solutions, if you will -- wasn't enough to match up against who is still one of the Democratic party's best messengers in history in President Obama. The fact Obama has performed so poorly and Romney getting gradually better as a candidate meant that the the election ended up being quite close in reality, but victory in large-scale elections often depends upon people also being FOR what you have to offer the country. That's where Jindal's comments come in. Jindal is absolutely right that too often the Republican Party has seemingly written off too many voters. While we are always wise to attempt to identify voters as more likely to be with us than not, we cannot simply accept that as reality and then only go after those voters. If we truly ever want to politically realign the country in our favor -- so we can win the popular vote in more than 1 out of the last 6 presidential elections -- we need to, as Jindal says, go after every single voter. As Jindal also clearly stated, this does not mean we change or adjust our principles. It simply means we need to clearly articulate our vision and our philosophy so the voters understand what we believe and why -- and it also means we need to be prepared to propose comprehensive solutions for the country's problems that people can wrap their arms around. People will then know what we are for, not just what we are against. This blog feels strongly that conservatism offers a vision and solutions, when properly implemented, that every American can get behind, regardless of their particular demographic. To further that point, what makes -- or should make -- conservatism attractive as a philosophy is that it does not require such divisions in order to win at the ballot box or to be implemented -- which is a much healthier prescription for the country long term, as well. We cannot continue to be so divided among so many cultural fault lines -- geography, race, marital status, gender, etc -- and have America truly be the shining city on the hill. Obviously, we will never win every vote -- but conservatism can never be fully implemented and its benefits fully realized if we continue to think large segments of voters are beyond our reach, particularly when those segments of voters are growing, not shrinking. So, what does this mean, in reality? It's very easy for us to say things and not mean them. It means on immigration, articulating our vision in a way that is not offensive to large segments of voters, while also offering a solution that Americans, as a whole, regardless of background, can get behind. It means perhaps coming to grips with the fact that what we are offering now isn't winning us elections nor will it ever truly be successful in solving the problem. It means on marriage, not just being against gay marriage, but FOR marriage as an institution. It means having the courage to discuss why traditional marriage is a key structural institution for a civilization to remain vibrant and grow. It means embracing healthy marriages as a culture, which goes well beyond politics, but into our churches and public discourse as well. Promoting the family and marriage is a key ingredient in solving many of our country's greatest issues, so we must do more than just say we're against one type of marriage -- we must be FOR marriage and family as a broader basis as well. In means on limited government and economic freedom, not just talking about those ideas in the abstract but by specifically discussing why those principles, when fully implemented, will benefit everyone from the business owner to the entry level employee. We need to discuss WHY lower taxes and fewer regulations are beneficial, not just basically saying "studies prove that they do." It means on abortion, being able to clearly articulate why promoting and protecting life is so vital in our culture, and not coming across like we are against birth control or are trying to invade the bedroom. On a broader basis, it means understanding that many Americans feel tempted to vote for Democrats not because they want to be dependent, but because they see no alternative to ensure they can not only live a happy life, but actually do basic things like pay the bills and put food on the table. Clearly articulating to every voter why what we propose will make them prosper is the key to disrupting the Democratic strategy of hand outs and big government and fear mongering. True political realignments occur when the surging vision is one that Americans, as a whole, are inspired by and can unify behind. People unify behind something because they believe in it, understand it, and then communicate about it with their friends...thereby causing people to rethink their previous leanings and perhaps start choosing the conservative path of governing rather than the liberal one. 1. Communicating the conservative philosophy to every single voter, regardless of what "group" we think they are part of. 2. Crafting solutions, based upon that philosophy, that clearly address many of the nation's ill, that the American people can understand and get behind. 3. Promoting candidates who can clearly articulate the conservative philosophy and solutions and in a way that attracts, instead of repels, voters. If we don't do the above, we will increasingly become a party dominant in some states but incredibly weak in others, dependent on the utter failure of the other side in order to win, and also dependent on the narrowest electoral paths to achieve victory on a national basis. And, given the way the demographics are headed as a country, that choice will increasingly lead us to electoral defeat. Bobby Jindal seems to understand this, and it would be wise for other national conservative figures to as well. In Senate District 8, incumbent Senator Tim Owens has an opponent -- Rep. Greg Smith. In Senate District 31, incumbent Senator Carolyn McGinn has an opponent -- Gary Mason. In all three cases, the "Buffalo 30" map -- favored by liberals -- draws out their opponents. It's been fairly easy for liberals to attempt to draw out their conservative challengers simply because their opponents have been campaigning for months. The other side of the story, uncovered by the media, is the possibility that the Buffalo 30 map -- which radically draws many districts to the point that half or more of some districts are new territory -- might attempt to draw "in" some candidates in an attempt to perhaps steal a seat or two. However, unlike their courageous conservative counterparts, these folks have yet to declare their intentions -- perhaps because waiting for a magical map to appear so they can run in a friendlier district. Even if no changes were made to any Senators in the CURRENT Senate, there is no guarantee that the liberal power coalition would remain in power. After all, in the Republican Caucus, 18 of the 32 Republicans have consistently been voting conservative on maps, taxes, life, and other issues that often define whether one is conservative or moderate -- so one wonders if perhaps conservatives are on the cusp of power, even with zero changes. The moderate/liberal coalition needs to win 2-3 seats and prevent any conservative takeovers in order to be assured of having their leadership retained. An odd, vertically drawn district -- stretching the entire north-south length of one county and halfway through another -- can only be drawn so as to perhaps reduce the # of conservatives. So where did District 32 go? 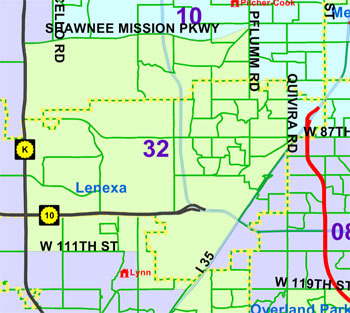 See, for years, Lenexa has been split up largely into two Senate Districts -- Senate District 10, occupied by Senator Mary Pilcher-Cook, has northern Lenexa -- and Senate District 9, occupied by Senator Julia Lynn, has the remainder. In this map, though technically four Senate districts would include parts of Lenexa (one precinct in 10, Four in 8, and a couple in 9), the bulk of it --is drawn into Senate District 32. See, in the 2008 general election, both Julia Lynn (District 9) and Mary Pilcher-Cook (District 10) won by a 55% - 45% against their opponents. Now with four years under their belt, they are unlikely to be defeated in what is largely viewed as a much friendlier year for Republicans, and especially conservative Republicans, particularly in Johnson County. Draw a new district wedged in between Lynn and Pilcher-Cook (who as you can tell by the map live just outside the new district), despite the fact both have represented significant portions of that district for the last four years, and for a new Senator on folks where one is not needed. The thinking by moderates and liberals is that by including the bulk of Lenexa (which is viewed as more moderate than Shawnee or Olathe) into this district, they can perhaps make it possible that a moderate (like Rep. Worley) might win. 1. In the case of District 9, represented by Senator Lynn, they remove nearly all of Lenexa, which has been represented by District 9 for two decades. Now, District 9 needed to lose population so some of this was expected -- but they did so in a way that actually gives western Shawnee -- stretching up to Bonner Springs -- to District 9. (More on that in a minute) That portion of Shawnee is currently and has been with Senate District 10 for decades. 2. In the case of Senate District 10, which needed barely any changes population wise and thus should have largely remained intact as is -- it not only lost western Shawnee, it nearly lost all of Shawnee south of SM Pkwy -- and picks up northern Overland Park, much of Merriam, and even a precinct in Mission...all areas with more Democrats. - In Olathe, areas between 135th and 143rd Street between K-7 and I-35 were added to District 9. Precincts with 28-30% Democratic representation -- significantly higher than the 15-22% in some of the northern Olathe precincts she loses. - Several precincts were also added in western Shawnee. The key thing to know about these precincts is that they are in the De Soto school district. 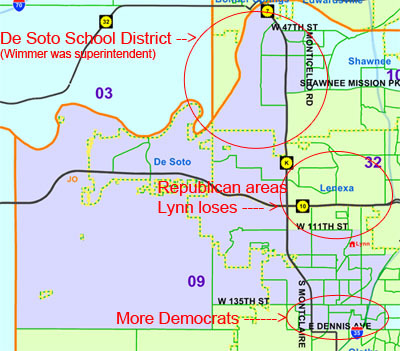 Now, let's put those two clues together -- De Soto school district and more Democrats. What Democrat ran against Julia Lynn, fell 5% short, and was the Superintendent of both the Olathe and the De Soto school districts (from 2009 to 2010)? If you guessed Ron Wimmer, you are correct -- the same Ron Wimmer who is intervening in the current lawsuit over maps that currently resides in federal court! Ron Wimmer is thinking -- if I can add areas of western Shawnee where they know me from being Superintendent and don't know Julia, and if I an add a few Democrats to my numbers in Olathe in precincts that also don't know Julia, perhaps I can close that gap between 45 and 50%. To be clear, we think Wimmer would still fail -- Julia is a tremendous campaigner with a ton of cash -- but one doesn't have to be a rocket scientist to figure out the mods/Dems' thinking here -- they want to try to beat Julia Lynn. In District 10, the situation is even more blatant. District 10 has represented all of Shawnee for decades. Also, remember, per the census District 10 only needed to lose a slight amount of population -- meaning it shouldn't need hardly any tweaking, and one could certainly keep all of Shawnee (nearly the size of a Senate district itself) in the boundaries. In Buffalo 30, however, it would be split up into three areas. 1) Senate District 9 (to accommodate Wimmer) would take up western Shawnee. 3) Senate District 10 (where Mary Pilcher Cook lives). In addition, it would lose several precincts to District 32 in northern Lenexa. "Why wouldn't the new Senate 32, in an effort to be more moderate, go grab those northern OP precincts and allow District 10 to at least keep southern Shawnee, which has been with District 10, again, for decades?" 1. 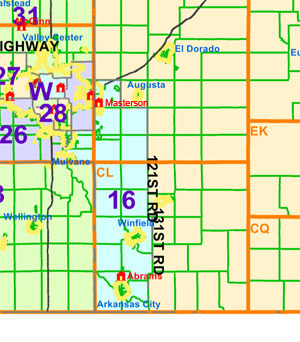 The areas that District 10 acquires don't know Senator Pilcher-Cook. 2. The areas that District 10 acquires, when combined with the areas it loses, make it much more Democratic. 3. Lisa Benlon, a former State Representative, a Democrat, who was previously a Republican, who ran in District 10 in 2004 (when she lived in Shawnee) and got 42%; now lives in the area of northern Overland Park that Buffalo 30 would give to District 10. So, in this case, while gutlessly drawing out Greg Smith out of District 8 and challenging Tim Owens, they are simultaneously quite likely trying to draw in Lisa Benlon along with a whole bunch of new Democrats. They want to try to beat Mary Pilcher-Cook. Much like in District 9, we do not believe they would be successful -- Mary Pilcher-Cook is perhaps the best grassroots campaigner this county has ever seen since Kay O'Connor. However, the attempts to defeat both Lynn and Pilcher-Cook, and replace either Masterson or Abrams with a new Johnson County moderate like Ron Worley -- provide clues that not only is the left wing coalition trying to play defense by drawing out conservative challengers -- they are also trying to radically and creatively redraw districts into nothing like they were before -- all in an attempt to oust three conservatives who currently make the difference between a moderate GOP caucus and a conservative GOP caucus. As we pointed out in our last column, what shouldn't be lost on folks is the fact that the current maps -- which are most closely reflected in the conservatives "For the people" map as drafted by Senator Abrams -- elected 40 Senators who put the moderates into power. However, in Kansas, things have changed the last 10 years and they are afraid that similar districts - would turn out a different result in 2012. So out the door goes the ideals of similar representation, fairness, and respect to the voters -- those don't matter anymore. What matters now is Steve Morris, Anthony Hensley, Tim Owens, John Vratil and company attempting to gerrymander a liberal Senate on a state that doesn't want one. These maps are the signs of a desperate group of politicians attempting to cling on to power. They violate every basic principle of redistricting and are an affront to common sense and fairness. As such, to use a term coined by Senator Owens, they should be tossed in the garbage and rejected by the Federal District Court. Why is the Kansas Senate Leadership so Gutless? In assessing the Kansas Senate, we can only arrive at the opposite conclusion – its leadership, backed up by a 21-member coalition of liberal Democrats and Republicans-in-name-only, is also achieving history of its own - but not for courage and shrewdness, but for arrogance and gutlessness. Accused of playing politics with the maps, Sen. Tim Owens angrily said he was tired talking about that "garbage" and stormed out of the committee room. Meanwhile, conservatives were agitated because Senate President Steve Morris and Senate Majority Leader Jay Emler did not attend the meeting to discuss to the maps. Sadly, as the article goes on to discuss, this debate over maps has spoiled over to the budget, taxes, and school funding. Basically, the children are in charge, and Kansas is being held hostage in the process. Now, before we go forward, let’s be clear – there are many in the Kansas Senate working diligently to actually improve Kansas. Senators like Mary Pilcher-Cook, Julia Lynn, Ray Merrick, Rob Olson, Ty Masterson, Steve Abrams, Garrett Love, Rob Olson and others are using every tool in their toolbox to attempt to overcome what is a narrow, shrill, desperate liberal majority forged together by 14 RINOs and 7 of the 8 Democrats. Politicians with courage would pass a respectable map as close to the current districts as possible in a timely fashion, close out the session quickly, and move onto the campaign trail and actually try to defeat their opponents by defending their votes and beliefs. Not this bunch. Instead, they have opted to stand in defiance and blatantly and shamelessly draw a map which protects their power by radically redrawing some districts while at the same time gerrymandering out their own political opponents! Come to think of it, this coalition of cowards may want to consider forming their own party with a chicken as its symbol. In all seriousness, their actions do beg the question-- what exactly are they afraid of? At its surface, this debate over maps seems nonsensical. Remember, it is Senate conservatives who have attempted to pass a map that is quite close to the current map – a configuration which has brought us two decades of moderate-to-liberal leaning leadership. Therefore, if Kansas really was the moderate state that Morris, Emler, Vratil, Owens and their allies claim it is, and its citizens really embraced their views – wouldn’t their reelection be virtually assured? Particularly given the fundraising advantages that come with being in power, conventional wisdom, history and a basic political analysis all say that Morris and friends should be able to crush most any challenger. Or, could it be that after two decades of failure, on everything from school finance to job growth to our excessive rate of taxation, and after the 2010 election which ushered in four conservative congressmen, a conservative House and five conservative statewide officials, that Senate leadership is afraid they might be turned out of office? Could it also be that after 20 years of using the “fund education” strawman as their chief political weapon, the people of Kansas have caught on to the notion that doing the same thing repeatedly doesn’t produce different results? Could it also be that the Kansans want their government to actually be smaller? Could it be that Kansas is truly a pro-life state? “YES”, of course, is the answer to each of these questions – which is exactly what Steve Morris, Jay Emler, John Vratil, Tim Owens and their friends are afraid of – they fear they will actually lose, and lose big, and the only way to stop the oncoming conservative train is to succeed at gerrymandering their way to victory. But, there’s more to it – because if conservatives were as extreme as the Senate leadership claims, wouldn’t Kansans just turn around and usher us out of power in four years, thereby setting back conservatism in Kansas for a generation? Or, perhaps not. Perhaps Kansans might like what they see, and our place as a truly red state will be cemented for a generation. See, conservatism, on a grand scale, has never really been tried in Kansas. Prior to Sam Brownback, we had 8 years of a liberal Republican governor followed by 8 years of a liberal Democratic Governor. While the House for points in that history was modestly conservative, the Senate has always been quite moderate, even when it had a large GOP majority. The consequence of this has been liberal policies. We’ve been the abortion capital of the world. We’ve been taxed to death. There is no choice in our school system due to a death grip by the NEA. Our government, until recently, grew each and every year. Our bizarre judicial system, handpicked by trial lawyers, is the most liberal of any state in the union. We couldn’t even pass the Health Care Freedom Amendment out of the Kansas Senate, for heaven’s sake. Now, those things are starting to unravel, and Kansans are getting a taste of the opposite and they like what they see. They imagine Kansas as a place of economic prosperity, where sales and income taxes are low, where jobs are created, where regulations are few, where government is limited, where competition thrives among schools, where liberty is protected, and where the sanctity life is cherished. That, of course, is what Morris and company are afraid of: Kansans, as a whole, will like that “new” Kansas, and once they get a full taste of it, there will be no going back. So, rather than defending their votes and beliefs on a battlefield of ideas -- the coalition of 21 Senators is essentially conceding defeat in the hearts and minds of the electorate, and instead clinging onto their power through some clever displays of geography on a map that Kathleen Sebelius would love. In the process, they’re embarrassing the state and exposing themselves as what they are – arrogant leaders who lack the courage – the guts -- to take their case to the people they claim to serve. Today, the Kansas House, in coordination with Governor Sam Brownback, showed great political courage in moving to concur on a previously passed measure to reduce taxes, a motion which passed 64-59. This high-stakes dramatic political maneuver, which we will explain in a minute, will certainly draw criticism and will frustrate those on the left to death -- but it is was a move that was nonetheless necessary, if you believe elections have consequences and if you believe people in power, elected to take decisive action, must seize opportunities before them, even if politically risky. It also signified a clear victory for conservatives in what had been a parliamentary and political game, with liberals and conservatives trying to out-smart the other, while also trying to score political points in the upcoming elections, which will be the most critical in the recent history of the state. Most of all, though, it showed what true legislative success, the outcome of political success, can be achieved when you have a Governor with guts -- and a House with a backbone. Truly, today's action was one of the shrewdest moves in Kansas history. Step 1. Governor Brownback originally proposed a plan to lower the state income tax, with the eventual goal of reducing it to 0. That plan included the removal of certain deductions, such as the home mortgage deduction. Step 2. The Kansas Senate Tax Committee, in a "gut and go" style amendment to a different House bill (previously passed, which is critical here), added the Governor's proposal, with some changes. Step 3. The full Kansas Senate, in March, added a "Christmas tree" of amendments, keeping the tax cuts, but restoring the deductions, as well as the sunset of the sales tax passed two sessions ago. This made the bill much more expensive -- and at current levels of spending, unsustainable -- than the original. However, conservatives, in order to keep the bill alive, voted for it. However, the Senate originally killed it, though, on a vote of 20-20 -- but then on a motion to reconsider, passed it 29-11. Among the 29 votes in favor were several left wing Republicans, including President Steve Morris, Majority Leader Jay Emler, Terrie Huntington, and others -- all voting for it so, come August, they could say they were in favor of tax cuts -- thinking that this version would eventually never pass. Step 4. Because that version of the legislation was too expensive, House and Senate negotiators have recently been engaged in a conference committee which put the bill (same bill #) more in line with the Governor's original plan (some changes, however). That plan -- much less costly than the original passed by the Senate -- was then forwarded to the Senate today for debate. See, liberal Senate Republicans, along with Democrats, don't like Governor Brownback, and they don't like tax cuts. They like tax increases, big government, and political damage to Governor. So, despite the conference committee having forwarded the compromise plan to the floor, it was highly unlikely that the full Senate would adopt the plan -- thus potentially, given this late date in the session, pushing off tax reform -- a critical thing needed in Kansas -- to at least next year. Throw in the redistricting mess and the general uncertainty of elections anyway, there is no guarantee tax cuts would ever be seen. Remember the tax cut bill that the Senate passed in March? It, since it was technically was passed by the House and was amended by the Senate, could still be passed by the House and sent directly to the Governor. How? On a motion to concur. If such a motion passed, the bill would go directly to the Governor, and the debate in the Senate over the revised version would die. BUT, if the Senate killed the revised version first - then the action in the House would be void -- because it would nullify the previous vote which passed it. The simple question was -- who would act first? That brings us to Steps 5 and 6. The answer was the House, which passed the motion to concur on the more expensive version of the bill on a vote of 64-59 before the Senate could act. But that was really "Step 6". Step 5 was Senate conservatives who kept the debate alive on the revised version (which again, the Senate was going to kill) long enough to pass. The vote sends the bill directly to the Governor, who, when it's officially presented to him, will have 10 days to sign it, veto it, or let it become law without his signature. Governor Brownback said today he would sign the bill, but urged legislators continue to work on his ideas. In essence, that 10 day window -- really, 12-14 days by the time he receives the bill -- gives House and Senate negotiators time to pass a different version of the legislation that is closer to the version that the House and Brownback want. If negotiators can get 63 (majority of the House) and 21 (majority of the Senate) to pass a new bill in that window, the Governor will sign that bill and veto the version passed today. If they don't, then the Governor will sign the version passed today -- and work to fix the unsustainable parts of it in a future session. In the short term, it puts the pressure on a few squishy Senate Republicans to either pass the tax reform package desired by the Governor and House -- and thus settle the issue, without having to worry about fixing the budget gap later through fixes to the plan passed today. In the long term -- and this is the most important part -- today's action guarantees that there will be significant tax cuts signed into law, ensuring we will be on our way to fundamental tax reform and economic prosperity in Kansas. What's ironic in all this is that several of the politicians who were trying to harm the Governor -- Morris, Emler, Huntington, etc. -- voted FOR the version of the tax reform that they are now complaining passed the House today. So, while trying to protect their own hides by originally voting for tax cuts that they didn't really favor on a version they didn't think would ever really be signed into law, they kept the bill alive -- setting up the possibility for what happened today, which is that tax cuts will be signed into law, but only because they voted for it to begin with. Do the left wing Republicans in the Senate cave and vote for a version more in line with Brownback's original package, in which case conservatives -- and the state of Kansas -- win? Or, do left wing Republicans refuse to act and not pass anything, which means that the version passed today is signed into law, in which case conservatives -- and the state of Kansas -- win? Of course, in the latter case, some will say "oh, but the budget deficit!" No worries here, folks. Brownback and the conservatives in the legislature know that whether it be next session or in a special session, that the issues in the bill passed today -- will be fixed, and the nightmare scenarios outlined will be avoided. Now, are there risks in this? Yes. There always are in politics, but those who don't take risks don't get rewards. Given the Democrats were universally opposed to the bills, they could perhaps make hay of it and try to say that Republicans are being irresponsible -- but, the fact is Democrats are very weak in Kansas and that risk is minimal -- and Republicans could always justifiably charge in return the Democrats have zero interest in tax reform in Kansas. As for the August primaries, which will largely take place in the Senate, the risk is also minimal - given that many of those moderates being challenged voted for the original version -- so they really can't complain about it passing. Plus, if challenged, the conservatives who voted for it can simply say that they will fix it -- but that it was necessary to pass in order to achieve tax reform -- and in doing so, point out the games played by the moderates who voted for the expensive version but were going to block the budget-sound planned favored by the Governor. So, in one political maneuver, conservatives called the bluff of the Senate liberals who voted for the plan and passed significant tax cuts on behalf of the people of Kansas. In the end, a weaker Governor wouldn't have achieved this -- he would simply watched his bill die or be so severely weakened it would be categorized as a loss, both politically and legislatively. However, because Kansas has a Governor with guts and legislative conservatives willing to back him up, today Kansas achieved a great victory -- and we believe that history will look back on today's actions as one of the most bold and courageous in Kansas history. Labels: conservatives, Kansas House of Representatives, Kansas Senate, moderates, Sam Brownback, Steve Morris. As the calendar approaches Labor Day, one could say that politically speaking, we are in the calm before the storm. With people taking their last opportunity at vacation, school starting, and football games occupying people's time on weekends, politics is taking a bit of a back seat. This is a good thing, because in politics as in all areas of life, people sometimes need time to breathe and relax before things intensify again. And, things will indeed ramp back up soon. On a national level, with Rick Perry just entering the race and Sarah Palin considering a bid, things are going to heat up quickly with five debates in six weeks beginning September 7. Over the next few months, candidates will begin to emerge for U.S. Senate races and the newly drawn Congressional seats all across the country, including here in Kansaas. At the state level, battle lines are currently being drawn for what will surely be an historical attempt by conservatives to take the Kansas Senate, with a slate of exceptionally strong conservatives taking on both Democrats and the most left wing of the Republican caucus. Here at Kaw & Border, we will of course be covering this. Given the heated nature of those races just over the horizon, we should take this down time not only to relax, but to look more broadly at the future of the conservative movement in Kansas -- for if conservatives are indeed successful in both August and November of 2012, a "new normal" will emerge in Kansas like none we have ever seen before -- one with conservatives in control of the House, the Senate, the Governorship and most every statewide office save Insurance Commissioner. Yes, conservatives will have finally won, and likely achieved victory in a political reality in which the fromer-moderate wing of the Republican Party is essentially killed off and where the Democratic Party is so weak it has little to no means of growth, at least in the next few years. Of course, nothing in politics is permanent but if the conservatives should be successful of defending their 63 in the House and achieving 21 in the Senate, it they will likely have control for at least four years, if not longer. However, while indeed such a victory should be cause for immense celebration because of the decades of blood, sweat, tears and prayers that would have taken to achieve, it will present new challenges as well. Much like the dog who catches up with the car, conservatives will have to decide how to handle themselves once they achieve full control. One of the realities of "absolute power" is that when you don't have anyone to beat up in the opposition, your opposition often becomes each other. Certainly, disagreement is healthy and welcome, but if and when conservatives obtain complete control in Kansas, one of the key challenges will be to ensure that such disagreement is communicated with respect -- both from those communicating a disagreement and from those who would seek to stifle disagreement for the sake of unity. 1. Overuse of the term "RINO". Make no mistake, there are RINO's -- John Vratil, Tim Owens, Terrie Huntington, etc. The list is not short. However, too often, both at the national and local level, certain folks within the conservative movement are beginning to toss the "RINO" label at anyone who dare takes a different view on a particular issue, or even when there is an agrement on an issue and there is just a slightly different strategy for getting there. Case in point on this front is the recent debate over the debt ceiling hike. We at Kaw & Border preferred the stance that Tim Huelskamp and Kevin Yoder took in voting no on debt hike. However, Paul Ryan, Allan West, and others who voted yes are NOT RINO's, yet there were attempts by some in the conservative movement to label them as such.. Neither is John Boehner, Mike Pompeo, or Lynn Jenkins. Wherever the "RINO line" is, those individuals are on the right side of it, not the RINO side. We're all headed in the same general direction. Now, this does NOT mean that conservatives can't or shouldn't express disagreement with those individuals over a particular issue such as the debt ceiling -- in fact, they should do so and do so in an EFFECTIVE and respectful way. On the flip side, those who voted "less conservative" (using that term loosely) -- often referred to as the establishment -- should not seek silence or "penalize" those who voted no and take a more firm position on those issues. What should happen is that there should be a vigorous debate and then we should keep marching forward. The point here is that if we overuse the term RINO to mean anyone who doesn't agree with a certain conservative take on an issue, we cheapen the term. A RINO is someone who is truly not a Republican in any shape or form, and is only running as a Republican because they could not get elected as a Democrat in a state like Kansas. The aforementioned Johnson County Senators are perfect examples. However, there are many great conservatives who may take a different stance on one issue or another but are NOT RINO's -- and we do a dissservice to the movement when they are labeled as such. Again, it's all about respect. 2. Trying to Define Certain Positions on Issues as "THE Conservative Position". This trend is a little harder to define but is likely to play out once conservatives gain control of a state's branches of government. Conservatives will theoretically have the votes to pass anything they want, but there will be disagreements on how to move forward, and there will be natural tendencies -- tendencies that need to be resisted -- for some to call their own position as "the" conservative position, when in fact there may be two or more different approaches to the same issue, with both viewpoints representing solid conservative princiles. Now, there will be some issues -- the life issue for example -- where people are generally unified, and where conservatives should be expected to largely hold the line. We mentioned the life issue. We also believe that the same should hold true for marriage, a general reduction in spending, a general movement towards lowering taxes, etc. And, certainly there will be a need to ask for those principles to be adhered to and to encourage legislators to not drift with the political winds for fear of re-election. However, there WILL BE disagreements, sometimes strong ones, over the particulars of such legislation and we'll need to be respectful of those disagreements. There is a large difference between voting a different way on a particular bill or issue because of political reasons and voting a different way because you legitimately have a disagreement -- and we need to learn to distinguish the two. 1. Alcohol Sales. There are some conservatives who want to allow hard liquor to be sold in grocery stores and convenience stores, as they see it as a free market issue. There are some conservatives who want to keep the laws as they are, who see that the "liquor store" model for such products to be a good compromise between easy access and consumption. There is also the separate economic argument about not harming liquor store owners who have been used to the laws in this state for decades. The core issue here is how conservatives approach both economics as well as social policy on alcohol. Those on the more 'libertarian side' should refrain from calling those on the other side as extremists who are backwards thinking, and those on the more 'anti-booze' side should refrain from labeling those on the more libertarian side with similar unfair terms. There are two sides to this issue -- both with merit, both coming from conservative principles, and that debate needs to be held with vigor, free from labels which demean deeply held viewpoints. 2. Taxes. There is not one conservative approach to tax reform. Generally, we all want lower taxes. However, there will be disagreement on tax REFORM and how to get there. Some want a FairTax model, which moves away from the income tax and more towards sales taxes. Some prefer a flat tax model which throws up the caution flag on moving to a sales tax model for fear of regressiveness, stifling sales in general, and increasing government involvement in transactions between individuals and business and between two businesses. Some want to lower both sales and income taxes, keeping both in place but both at a lower level. All of these positions deserve a hearing and vigorous debate. Those promoting a FairTax like model should not call those opposed to the FairTax RINO's because they support retaining the income tax (though a lower one) and those who oppose the FairTax shouldn't label FairTax people as crazy or unrealistic, because they bring a well thought out position to the table. 3. Libertarianism vs. Traditional Conservatism. This is a broader concept, but it's one that could likely start to play out over time as libertarian thinking begins to make its way into the conservative movement. While we believe any efforts to undermine the definition of marriage should be resisted, there is room for disagreement on other issues, particularly economic type issues. Now, this blog is generally going to lean towards the traditional conservative line of thinking, but we also believe that the libertarian thinking shouldn't be excluded or shunned -- but welcomed. Let the debate play out. Again, it's all about respect and being able to debate issues without tossing labels at each other within the conservative movement. Remember, there are long term consequences if we don't go this path -- the movement could splinter, which could lead to a lack of progress on issues we care about while also providing an opening for our liberal opponents to regroup and make gains in a direction none of us want. That doesn't mean we shouldn't ever have a conservative vs. conservative primary, but it also doesn't mean we should ever completely fracture either. Our disagreements need to be communicated with humility and reason, not emotion or vindictiveness. If they choose the right approach, conservatives, should they continue to win, could be in power for a long time to come and we'll have a better state and nation as a result. Kaw & Border is dedicated to telling the story behind the story of Kansas City area politics -- both of the politicians themselves as well as political operatives such as key individuals, PACs, and other groups of influence. Much like the famous TV drama that is our namesake, our posts will be "ripped from the headlines" with the core mission of exposing the truth behind area politics on both sides of the border -- such as the quest for money, power, and the true agendas of some individuals and groups. Mostly, we will focus on issues in the Kansas City area and in both Kansas and Missouri politics, but from time to time we will touch on national issues as well. In addition, look for some thoughtful conservative commentary on occasion -- not just from us, but from thoughtful conservative thinkers across the two-state area as well as the nation. What this blog will not be is a vehicle for personal attacks on people, no matter which political persuasion fits their beliefs, nor will it be a place of unfounded rumor and gossip as seen in other political blogs. It will simply be a new news source for exposing the stories not told by the mainstream media -- and certainly not revealed by those entities wishing to not air their real agenda. All original intellectual content here is copyright by the owner of Kaw & Border blog at www.kawandborder.blogspot.com and www.kawandborder.com. Linking to this content is appropriate and allowed, but any duplication, replication and/or mirroring of this blog or its content on another website, blog, or printed material is prohibited without prior written content by the owner of Kaw & Border. You may contact us by emailing kawborder3@yahoo.com.